Hyundai has gone from a sideline spectator to a serious contender in an amazingly short space of time. 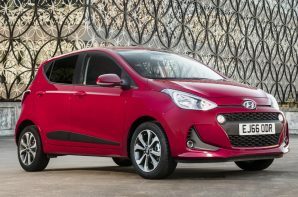 With a reputation built on keen value, generous warranties and a no-nonsense approach it is easy to see why the i10 has been a hit. However the latest version is priced head on with more established rivals, so without the bargain card to play is it still worth considering? The latest styling tweaks bring the i10 in line with the rest of the range. It does look a bit fresher than previous iterations, but it still isn’t a car that you buy on looks alone. The interior on the other hand does hit the mark, with contrasting coloured sections available it is bang on trend and the layout is pleasingly simple making for a grown up look that wouldn’t be out of place in German brands. On the mechanical front the little Hyundai forgoes the seemingly obligatory turbo charger, which makes for a clear point of differentiation. The normally aspirated 3 cylinder is predictably down on torque but it counters with a free revving nature and progressive torque curve that the blown 3s can’t match. There is more good news on the practicality front with an unusually big boot on offer the i10 puts most City Cars to shame. The slightly boxy exterior may not get the heart racing but the 252 litre boot is over a third bigger than the style heavy FIAT 500 showing the different priorities of the design teams. The i10 may not be the last word in style, and isn’t even that cheap, but it is a brilliant all rounder. We like the normally aspirated engine, the excellent official fuel economy, the very low insurance group, the big boot and the attractive interior. Coupled with a 5 year warranty and a reputation for excellent build quality the i10 remains a great bet.